Home News Condemned WWII hotel; If we only knew the memories within its walls! 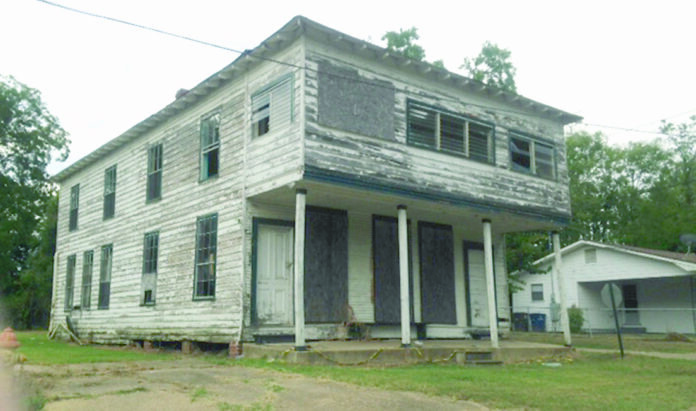 There was a plea at the City Council Monday to spare a historic structure from condemnation. Planning and Zoning Director Juanita Fowler filed written reports declaring that the buildings listed for condemnation are in dangerous and unsanitary condition which makes them unsafe and endangering to the public. She recommended that the buildings be demolished or brought to code. Among those on the list is at 801 Sixth St. While Jo Anna M. Hall is listed as the owner, Paul Morgan was at the meeting to plead for more time. He said the building at the corner of Lafayette and Sixth is in the Historic District and was once a hotel for black people. According to an entry from the Louisiana Regional Folklife Program, “The Brown Bomber Hotel provided traveling African Americans with comfortable lodging. Thousands of soldiers, black and white, came to Louisiana for training before they were shipped overseas during World War II. “The training, known as the Louisiana Maneuvers, brought thousands of blacks to north central Louisiana, and the Brown Bomber was one of very few hotels open to black clientele. “Soldiers who ventured to Natchitoches frequented the hotel and the Brown Bomber nickname may have originated from the color of the soldiers’ uniforms.” Morgan said it was named for the late Joe Louis, a world heavyweight boxing champion known as the Brown Bomber, who spent one night at the hotel. Morgan said he had been working on the hotel since Mayor Joe Sampite was in office in the 1990s. Now in disrepair, the paint on the building is peeling and the windows are broken. He asked for 30-60 days to take it to code. Mayor Lee Posey said he would call the National Center for Preservation, Technology and Training for an update on the building. He told Morgan it was a safety factor and that he should be ready to get to work and show progress. Owners of buildings on the condemnation list have 30 days to get permits and show progress before demolition can move forward. Many of the buildings are reported by neighbors and many have out-of-state owners. The list also includes: •1609 Northern St., owned by Maybell S. Rogers, Natchitoches •419 Sanford St. owned by Kenneth W. Burton and Connie R. Lincoln of Humble, Texas •619 Genti St., owned by Mavis B. Handsborough and Florence S. Watkins of Houston •415 Sanford, owned by Junius Eli Jr. of San Diego, Calif. •411 Sanford, owned by Calvin D. Irchirl of Natchitoches •528 Sibley St., owned by Kimberly P. Senu of Natchitoches. There are two prospective buyers and the owner said she would get a permit and list of needed repairs. •616 Railroad St., owned by Philmore Evans Jr. of Natchitoches •1028 Clarence Dr., owned by Rebecca J. Brister. Fowler said the structure is a double-wide mobile home that burned and was abandoned by the owner; it was financed by USDA. Fowler said USDA will also abandon the property. She said it should be removed.